2. Create marinade, soy sauce, sriracha, sesame oil and honey. 3. Chop carrots into bite size pieces and cover in 1/3 of the marinade. Top with Gomasio and put in oven for 40 mins, toss halfway through. 4. On a medium heat, add a dash of sesame oil to a pan with the extra lean ground turkey. Cook halfway then add the remaining marinade. 5. In another pan, add cauliflower rice with 1/2 cup of water, salt, pepper and garlic to a pan. Cook for 5 minutes, then add edamame and cook to desired doneness. 6. Once marinade has caramelized, add pineapple chunks and juice, cook until dissolved. 7. 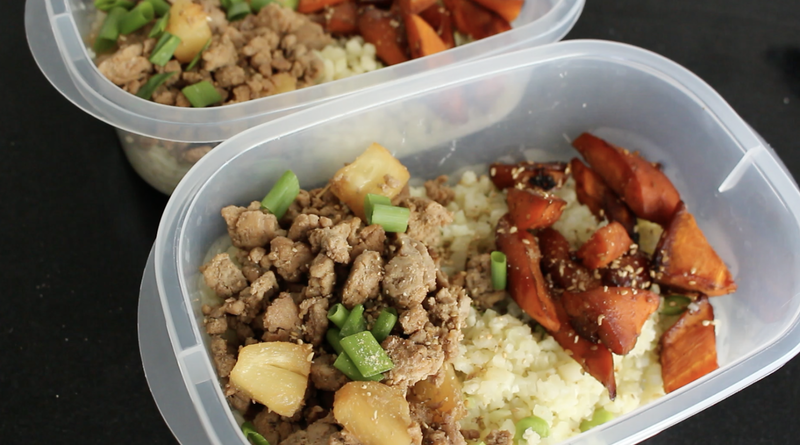 Add final products to tupperware if meal prepping and top with more gomasio and green onions.